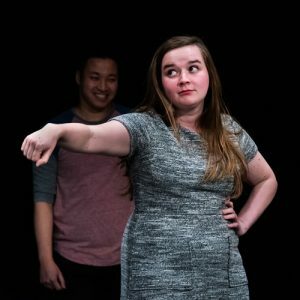 Maria Halloran began performing long form improv with Indiana University's Awkward Silence Comedy. Upon graduation, she promptly traded the cornfield’s of Indiana for the Capitol’s swampy streets where she immediately transformed into a full blown LIZARD GIRL. She is excited to be a part of Washington Improv Theater. Other notable DC performances include a heartfelt rendition of “Gloria” by Laura Branigan performed nightly in her shower and a 33 minute tour de force cardio- dance performance titled “Latin Zoom” which is showcased in her living room every Wednesday, Friday and Sunday for exercise.